I speak into my phone as the Google Translate App turns my words into Russian and spits them back at me in an Eastern European accent. “Yes. I’m sorry for bed. And for kitchen,” says the boy whose bottom bunk looks like two warthogs wrestled there before breakfast; the same boy who ignored his kitchen duties, choosing instead to watch TV. “André, I’m sorry bike,” offers the boy who stormed out of the house, disappearing on his bike for twenty minutes after Honey declined the boy’s umpteenth request for a device on which to access VK (Facebook’s European equivalent). “I forgive you. I apologize for speaking abruptly to you,” says my Honey to the boy whose head is now resting on the dining room table. “It’s okay,” the fifteen-year-old speaks softly without looking up. Where’s my apology? I’m sure I deserve one for the attitude I dealt with when I insisted the rap music disappear from the radio. And for the refusal to acknowledge my presence when I knocked on the closed bedroom door. And for the cold shoulder I keep getting from the teen with his head down. I recall the baby steps Bike Boy has taken toward trust as he’s allowed his guarded heart to open in my direction. 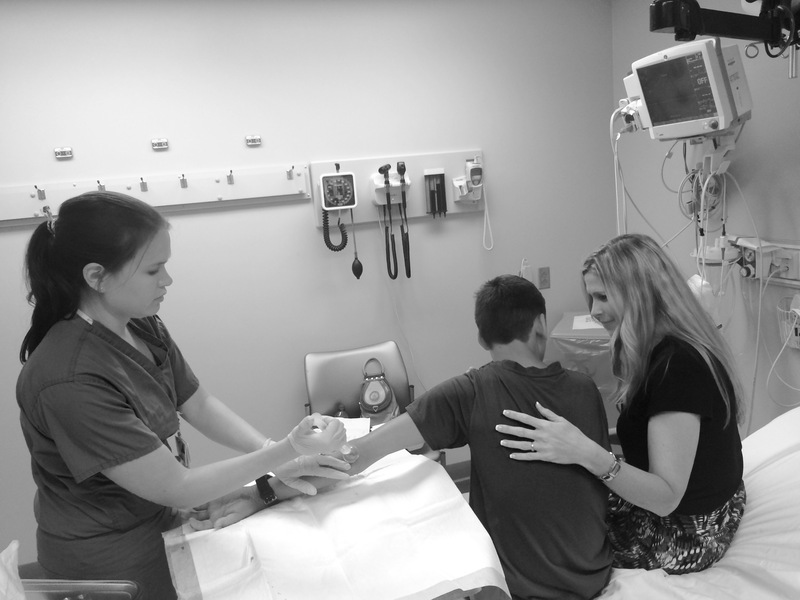 A recent RipStik (think skateboard minus two wheels) accident forced us into the Emergency Room, both of us white with nausea as he clung to me while the doctor sutured his elbow. The following day, during a car ride through the Tennessee mountains, he lay his head on my shoulder in a rare gesture of affection. I think about his aloof behavior today, the way he wore his sunglasses, even indoors, in order to avoid eye contact. How he flopped onto the sofa before evening worship with body language that needed no Google App to convey the message he was sending. I remember my own relapse into codependent denial as the product of Bike Boy’s deception accidentally dropped onto the living room floor for a millisecond before he scooped it into the pile of stuff he carried from our vacation-laden minivan. That can’t be what I think it is. Well-worn denial pathways in my brain instantly re-opened as I searched for a reason to explain away the evidence of deceit. Our eyes met for a moment as he fluidly gathered the contraband and disappeared into his bedroom. My broken brain automatically dismissed the facts my eyes had witnessed – just like it had over the course of my twelve previously married years to a chemically dependent spouse. I defaulted into denial and continued to unpack as if nothing out of the ordinary happened. I allowed the child to believe he had gotten away with his sin. That brief interaction threw me emotionally backward into a life I thought I was healed from. A life of covering for a chemically dependent narcissist who could convince me that my own senses were wrong and he was telling the truth about everything from where he’d been all weekend to what happened to his paycheck. A life I spent three years writing about in my recently published book Same Dress, Different Day. A life I no longer want to control me. I watch his eyes as my Russian counterpart repeats my plea. They meet mine for a second. “Okay,” he responds in English. This time, as Google Translate replays my words, I can almost see the veil fall over his face. It hides his eyes. Guards his expression. Builds a fortress between us. It took the help of another, more human translator to get to the bottom of the issue. But we did it. And I stood on the sidelines witnessing genuine remorse and relief as the wrong was made right again. Somehow, though, I continue to be walled out. The food I offer is refused. The affection denied. The interaction limited. It’s hard not to take it personally. It hurts. I’m reminded of my Heavenly Father. Of how I respond to His unconditional love with similar disdain. Of how guilt destroys our intimacy and how my own brokenness prevents me from allowing full access to His heart. This one experience with a broken child reveals to me a glimpse of My Father’s love. Despite my sin, He loves. Despite my rejection, he loves. Despite my fear, he loves. Despite my relapse into self-protective behaviors, HE LOVES. If you are interested in orphan hosting, please consider Project 143. This entry was posted in Codependency, Confrontation, Denial, Hosting, Recovery, Truth, Unconditional Love and tagged Denial, Hosting, Project 143, Reactive attachment Disorder, Teenagers, Trust, unconditional love by Juliet. Bookmark the permalink. Agape love, the love of God, always stands on its own and works from a position of initiation. Notice when John wrote “God is love” that he didn’t write “God is loving.” God doesn’t merely love us to the enth degree – God is love to the enth degree. Also, in the way redemption works – it’s not over and against our sin. God redeems us in our sin. So, when God loves us, it isn’t despite our sin, as though God were first giving attention to the sin with anger, then turning to us and saying “I still love you.” I STILL love you – that’s the way humans love – not the way God loves.